A richly illustrated companion volume to the acclaimed 7 Up film series—a fascinating longitudinal study, published to coincide with the film release of 42 Up. “Utterly fascinating,” “groundbreaking,” “unparalleled.” These are among the accolades American critics have used to describe the series of British television programs that began in 1964 when filmmaker Michael Apted set out to test the aphorism “Give me the child until he is seven, and I will show you the man.” He filmed fourteen seven-year-old boys and girls from all walks of British life and revisited the same group at fourteen, twenty-one, twenty-eight, thirty-five, and, now, forty-two. This series, chronicling their successes and failures, fears and dreams, is one of the greatest—and most fascinating—longitudinal studies of all time. 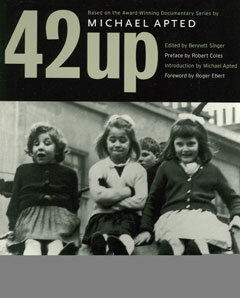 42 Up is being published to coincide with the American film release of the most recent installment and provides an overview from the project’s inception. Illustrated throughout, the book chronicles the life stories of each of the film’s subjects, capturing the spirit and candor of the films in an accessible, affordable format.